Offering you a complete choice of products which include printed drum cap seal and plain drum cap seal. 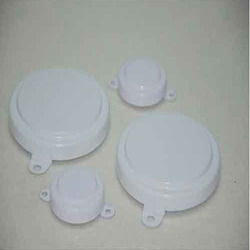 We offer a broad range of qualitative Printed Drum Cap Seal, which is used in various industries such as oil lube, chemical, Pharmaceutical industries and many more.We are supported and backed by the team of talented professionals, highly indulged in presenting a premium grade Printed Drum Cap Seal. These offered seals are manufactured and developed using finest grade basic material and contemporary tools. 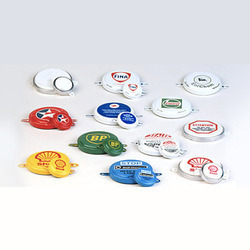 Apart from this, these seals are available in varied sizes and specifications. We offer these printed drum cap Seals in size 50 mm and 20 mm also widely known as 2, ¾, 1, 3, 4, 7, 72 mm, 75 mm, 80 mm, and 85 mm. We also offer customized solutions for our respected clients in order to cater their requirements. Our Product is made from finest quality of tin free steel & Plastisol” in order to achieve the best crimping / sealing results. We can create a new design for each of your products or use your existing artwork a company logo or even a photograph, These labels can be used on any of our cap seals or cap with a flat surface. We know your brand is important to your and our new laser printing system from kirao means you will get perfect color reduction and the highest quality every time. We offer a broad range of qualitative Plain Drum Cap Seal, Which is used in various industries such as Oil, Lube, chemical, pharmaceutical industries and many more. We offer these plain drum cap seals in size 2, ¾, 1, 3, 4, 7, 72 mm, 75 mm, 80 mm, and 85 mm. We also offer customized solutions to our respected clients in order to cater there requirements. Our product is made from finest quality tin free aluminum, steel and plastic in order to achieves the best crimping / sealing results. 20 mm Dai - 3000 Nos. Looking for Drum Cap Seal ?